Struggling to make ends meet? Worried about back to school costs? Help is on hand. 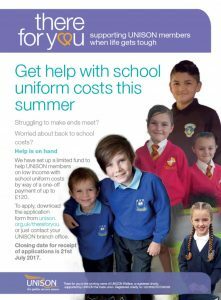 We have set up a limited fund to help UNISON members on low income with school uniform costs. You could be eligible for a one-off payment of up to £120. The closing date for applications is 21 July 2017. Find out more and apply for help.